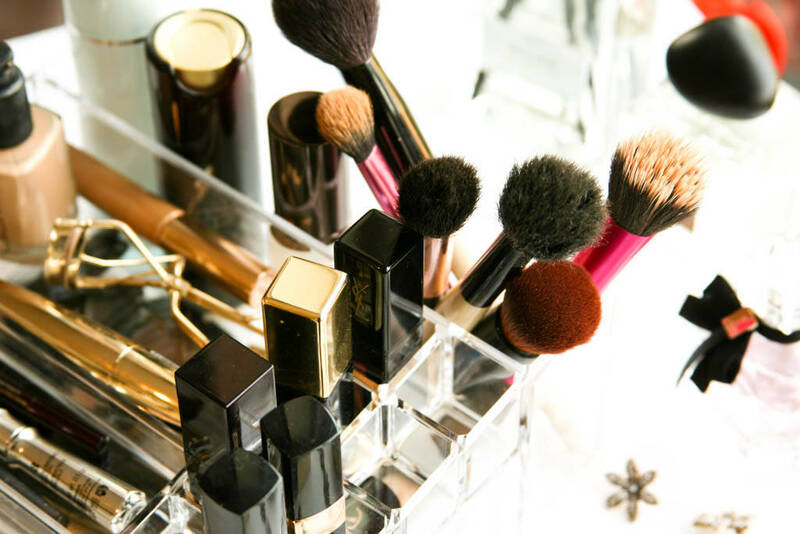 As I write this post, I realise that I am actually in serious need of sorting out my makeup and putting everything back where it belongs. When everything is in its rightful order though, my everyday “go-to” makeup and tools sit in this makeup organiser which I picked up from TK Maxx and as I love eyeing up how everyone else stores their makeup and beauty items, I thought I would give you a sneak peek into how I organise mine. 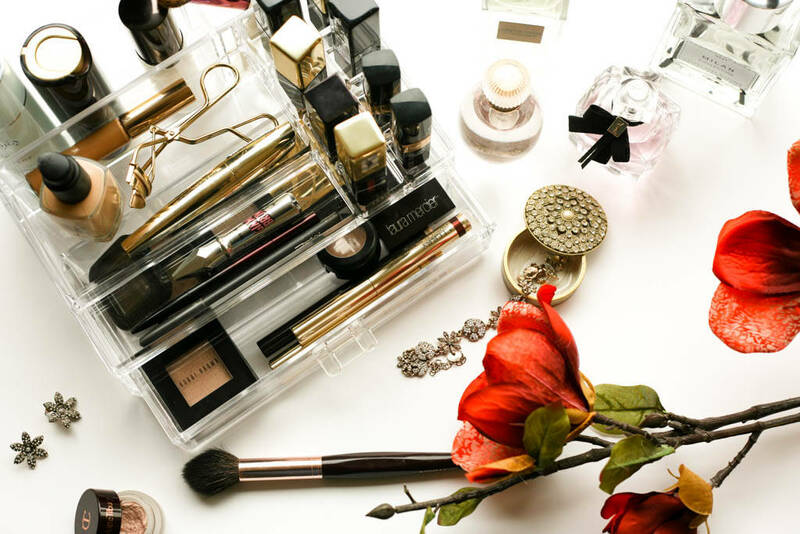 Of course this doesn’t hold all of my everyday makeup, just enough for me to reach those items that I tend to turn to on a regular basis without having to rummage through an endless stash. So, as well as looking neat and tidy, this saves me a lot of time in the mornings too and it’s surprising how much I can actually fit in here. 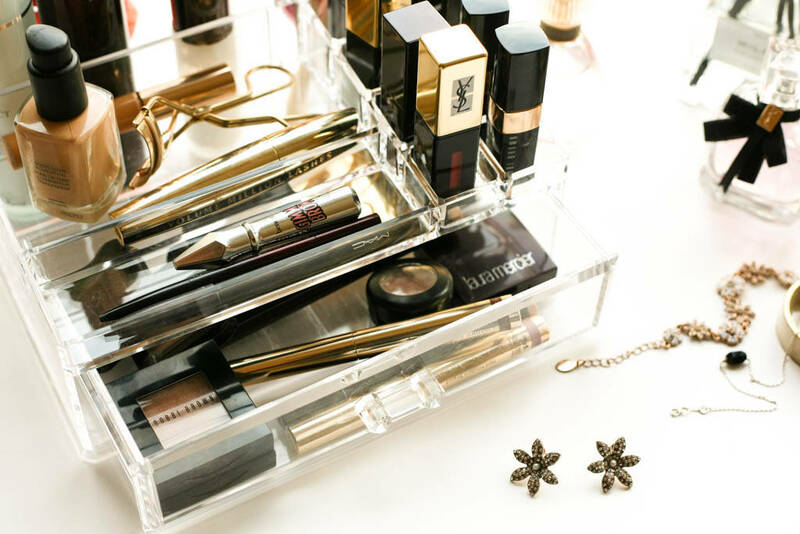 At the back are two sections which are deep enough to store some bottles and makeup brushes. To the left I like to place my primers and this is wide enough to house my favourite Hourglass Veil Mineral Primer and the Kevyn Aucoin The Primed Skin Developer, a new one I am using. You can find out about some of my favourite primers here. To the right, although a narrow space, I am able to fit in two foundation brushes, a powder brush, a blusher brush, a concealer brush and a highlighter brush, which is pretty good going I think. I am going to do a three-part series on my makeup brushes, the first of which is coming up on Wednesday 9th August so be sure to check this out. In front of my makeup brushes are 8 individual lipstick holders. Of course this is no-where near enough space to hold all of my lipsticks! 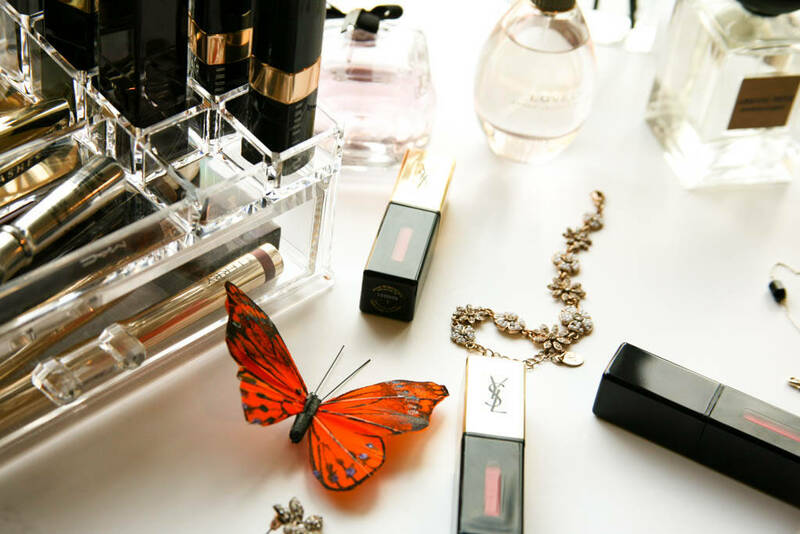 My recent post on My Luxe Lipstick Collection which you can read here will confirm that and as the packaging is so pretty, this is where I like to store my YSL Rouge Pur Couture Vernis A Levres Glossy Stains. To the left of the lipstick section are two separate fixed trays. The one at the back is a bit wider and where I put my Shu Uemura Eyelash Curlers (really important), my Nars Sheer Glow Foundation and my current mascara – the L’Oréal Volume Million Lashes. The tray in front of this is narrower and fits eyeliners and brow products very nicely. As you can see, for me this is currently the Benefit Gimme Brow Volumizing Eyebrow Gel and the Kevyn Aucoin The Precision Brow Pencil (I did a post on these two brow products here), as well as my all-time favourite eyeliner by Mac in Coffee, which you can read about here. Lastly, at the bottom is a fairly deep draw where I like to put my most used eyeshadows and eyeshadow sticks. The Kiko eyeshadows which featured in my post here as well as the Charlotte Tilbury Colour Chameleons (see my post here) have a firm place in this draw as do my By Terry Ombre Blackstar and Laura Mercier Caviar Stick Eye Colours which you can read about here. The draw isn’t big enough to hold many of my larger palettes but smaller palettes like for instance my Mac eyeshadow quad or eyeshadow duos can squeeze in. 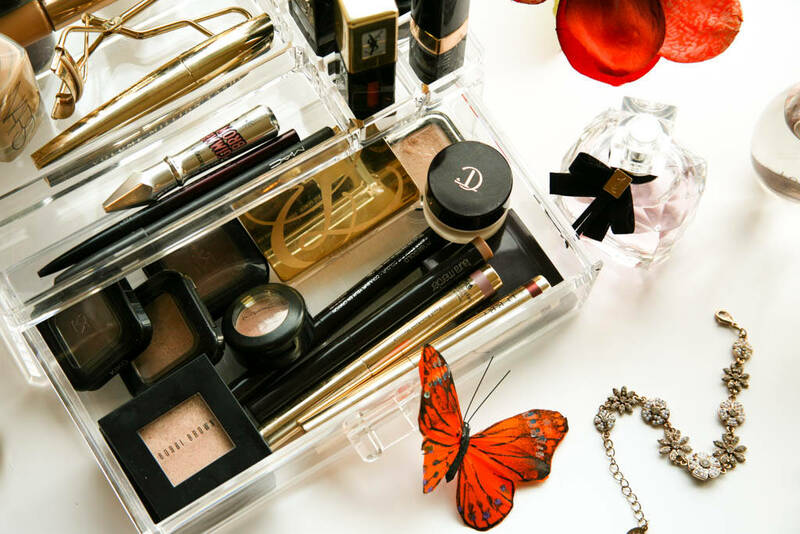 I’m sure you’ll agree that this makeup organiser can store quite a bit and other items like my skincare, blushers and highlighters are within easy reach on my dressing table or in my dressing table draw. It’s also hugely satisfying taking the time to organise everything!